My husband and I have always talked about taking a windjammer cruise and we hit the jackpot with Island Windjammers. We had planned on 2 nights in Grenada before we boarded the Diamant, but because of weather delays we arrived the night before embarking. The one night at True Blue Resort was wonderful and we&apos;d love to go back and spend more time there and explore Grenada. On Sunday we gathered at the designated dock, which was easy to locate from their directions. There we were met by a representative from Island Windjammers who introduced us all to each other and to the bosun Roy, who handled our luggage. Once onboard we met the captain and the rest of the crew (5 in all) and after being shown to our cabins we set off. The cabin was compact but very adequate. We had chosen the room with 2 beds side by side rather than the bunkbeds the other cabins had. The bathroom was great, best we&apos;ve had in a smaller ship. We were served appetizers and drinks right away and the food never stopped coming for the rest of the trip. Barney, the chef was amazing. The meals were varied and always included fresh vegetables and /or salads and fruit. 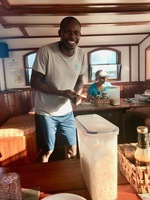 One of my favorites was a bbq he prepared on one of our beach excursions - the best ribs I&apos;ve ever had. Can&apos;t say enough good things about the crew. The captain, Danny and the others were delightful. Friendly and helpful, they really made the trip. Danny explained the next day&apos;s itinerary every evening at dinner. If any of us had specific preferences he and the crew made sure they were accommodated. 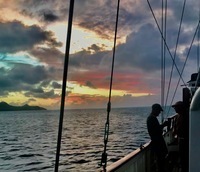 Every day was spent with at least a couple hours of sailing before we would anchor at a new island. 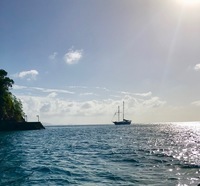 We were able to swim off the boat, snorkel from the beaches, visit the town to shop or explore, tour local museums, forts, waterfalls and botanical gardens. Danny gave us a little history of each place we visited and often went with us on our outings. He has a personal relationship with many of the locals which made the experiences that much nicer. If you enjoy sailing ( and we really sailed!) 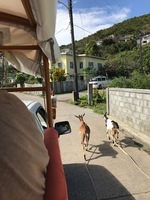 and prefer an intimate, personal trip rather than being one of hundreds or even thousands on a humongous cruise liner, we totally recommend Island Windjammers. My husband and I have always talked about taking a windjammer cruise and we hit the jackpot with Island Windjammers. We had planned on 2 nights in Grenada before we boarded the Diamant, but because of weather delays we arrived the night before embarking. The one night at True Blue Resort was wonderful and we&apos;d love to go back and spend more time there and explore Grenada. On Sunday we gathered at the designated dock, which was easy to locate from their directions. There we were met by a representative from Island Windjammers who introduced us all to each other and to the bosun Roy, who handled our luggage. Once onboard we met the captain and the rest of the crew (5 in all) and after being shown to our cabins we set off. The cabin was compact but very adequate. We had chosen the room with 2 beds side by side rather than the bunkbeds the other cabins had. The bathroom was great, best we&apos;ve had in a smaller ship. We were served appetizers and drinks right away and the food never stopped coming for the rest of the trip. Barney, the chef was amazing. The meals were varied and always included fresh vegetables and /or salads and fruit. One of my favorites was a bbq he prepared on one of our beach excursions - the best ribs I&apos;ve ever had. Can&apos;t say enough good things about the crew. The captain, Danny and the others were delightful. Friendly and helpful, they really made the trip. Danny explained the next day&apos;s itinerary every evening at dinner. If any of us had specific preferences he and the crew made sure they were accommodated. 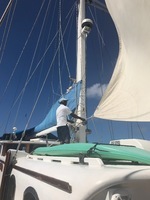 Every day was spent with at least a couple hours of sailing before we would anchor at a new island. 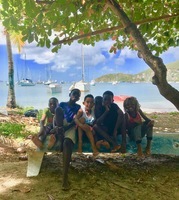 We were able to swim off the boat, snorkel from the beaches, visit the town to shop or explore, tour local museums, forts, waterfalls and botanical gardens. Danny gave us a little history of each place we visited and often went with us on our outings. 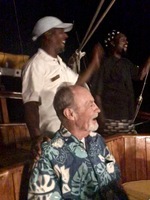 He has a personal relationship with many of the locals which made the experiences that much nicer. being one of hundreds or even thousands on a humongous cruise liner, we totally recommend Island Windjammers. 5 cabins total including owner&apos;s suite. Most were bunk beds, ours had side by side beds with storage below. Beds were very comfortable - being rocked to sleep every night was a plus ;) Bathrooms were efficient with great showers. Browne, the chief steward refreshed the rooms daily and changed the linens midweek.